We are at our final atoll, Nikumaroro. (Read about our other adventures on this island here and here.) 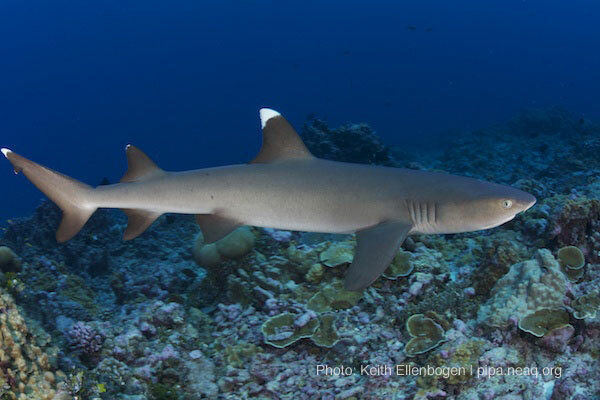 I always like to end on Nikumaroro – not only is the atoll scenically stunning with its long extended reef flats, thick tropical vegetation and white sandy beaches, but the reefs here seem to draw lots of pelagic fish near or adjacent to reefs, and the shark populations are still very healthy. 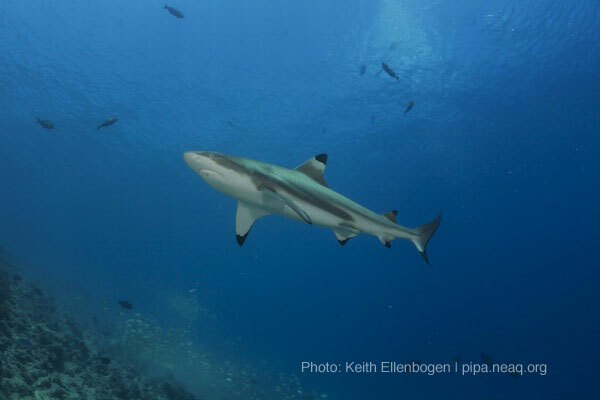 So far, we have recorded six species of sharks in the Phoenix Islands. 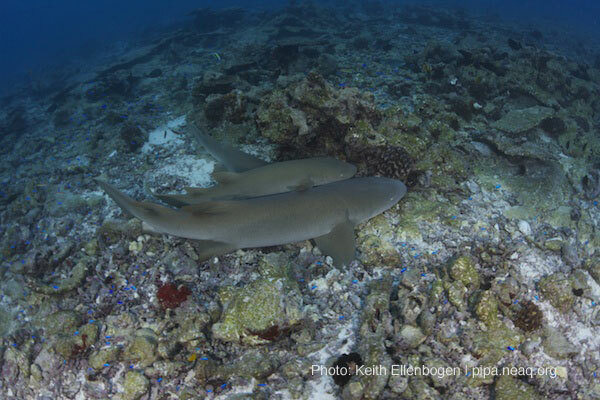 The most common have been grey reef, white tip and black tip reefs sharks which are fairly typically found on healthy coral reefs. We have also seen grey nurse, silver tip and scalloped hammerhead sharks at a couple of the atolls. This is heartening when so many coral reefs around the world have such decimated populations of sharks. 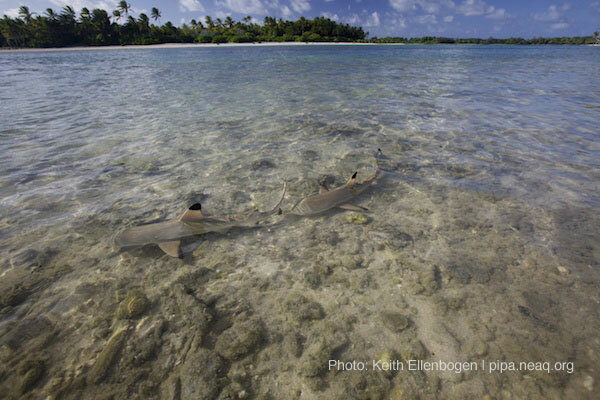 The lagoon at Nikumaroro is shallow and acts as a nursery area for sharks, especially blacktips. Yesterday Tuake Teema, our representative from the Kiribati government (who was with us for the first expedition and the one in 2009) led a small trip into the lagoon to see if juvenile sharks were still present in the lagoon. We were happy to see juvenile sharks in the lagoon, a few of which are featured above. This sighting is particularly important since, according to Tuake, there have been a number of shark finning boats that have come into these islands and have severely impacted populations at Kanton, Orona and Rawaki. As Tuake and Keith approached the waters’ edge 15 small sharks came up curiously to check them out, swimming right up to their ankles. With the inception of PIPA, all of the islands became no-take zones. Now, shark finning is highly illegal. Protecting sharks is one of the many functions of the no-take zones within the Phoenix Islands Protected Area. Out on the reefs larger grey reef, white tip and black tip sharks patrol the reefs. As soon as we jump in, they race up to the surface often circling us a couple of times and then following us to the bottom. They then continue on their patrols crossing our paths many times. These animals are just spectacular to see in the water – the way they move so quickly under the water and how finely atuned they are to injured fish. If they spot an injured fish within second a number of sharks can race out of the depths and within seconds the fish is gone! 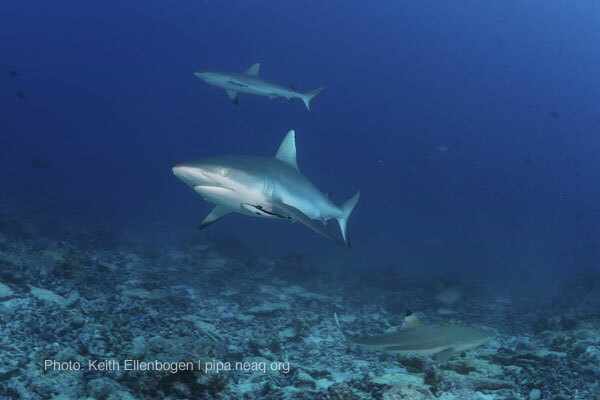 The recovery of the shark populations at these previously fished atolls is slow, but it is happening. If we can continue to protect PIPA, they will come back to their previous numbers.